Entering into service earlier this year, and set to undertake Australian sailings throughout the 2018-19 cruise season, the Majestic Princess is the most ambitious Princess Cruises vessel to date. The third member of the fleet-leading Royal Class from Princess Cruises, the Majestic Princess has been adapted to appeal to a wider demographic than any of her other shipmates. Spending her maiden season home-ported in Shanghai, Majestic Princess will soon arrive on Australian shores. From September 2018, she’ll be calling Sydney ‘home’, with an array of awe-inspiring features designed to impress and delight Australian cruise fans. She’ll be completing a selection of amazing cruise itineraries, touring the coastlines of Australia, Tasmania and New Zealand. Here, we have a look at a few of Majestic Princess’ most eye-catching features and most exciting amenities. 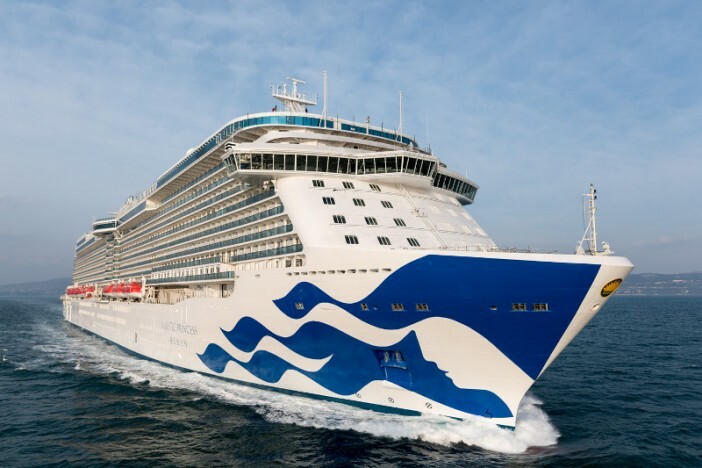 All the major cruise lines are going bigger and better with their cruise ship designs and Princess Cruises are no different, with Majestic Princess measuring up as the largest member of the fleet. With a capacity for 3,560 guests, Majestic Princess joins the exclusive list of megaships currently sailing the seas. With over 50 years’ experience navigating the world’s oceans, however, the Princess Cruises team have designed Majestic Princess so not to compromise space and comfort for any one of the 3,500 guests on board. Clever design tricks ensure that public areas are spacious and all suites and staterooms are delightfully comfortable. The line’s ‘Come Back New’ motto is never more apparent than on the newest member of their fleet. The Princess Cruises design team know that first impressions are hugely important, and that is immediately noticeable when you venture into Majestic Princess’ amazing atrium. The multi-storey heart of the ship is resplendent, decked in beautiful blues and golds. Fluid lines, circular staircases and glittering lights give the atrium an almost-alive aesthetic – an incredible welcome to the ship. A number of the ship’s best-loved drinking, dining and socialising spots can be found around the atrium, making it the perfect place to end another wonderful day aboard the incredible Majestic Princess. If you’re like us, one of the things you most look forward to when setting of on your holidays is all the great food you’re going to sample. And on this count, Majestic Princess certainly doesn’t disappoint. Combining the decadence of western cuisine with the delicious subtleties of the east; Majestic Princess boasts a wonderful array of eateries to suit any palate and appetite. Amongst the complimentary dining found on board Majestic Princess is World Fresh Marketplace – showcasing the finest cuisines the world over. From Germany bratwurst to Japanese curry, and almost everything in between – even the fussiest of eaters will find a tasty morsel, here. Naturally, with Majestic Princess homeporting in Shanghai during her maiden season, the ship boasts a couple of delightful Chinese eateries including Lobster & Dim Sum Bar and Chopsticks Noodle Bar. Although Majestic Princess will be offering a number of features and experiences which are completely unique amongst the Princess Cruises fleet, there will be a few old favourites we can look forward to. Most notably is one of Princess Cruises best-loved features, Movies Under the Stars. This wonderful open-air cinema located on the ship’s top deck provides the perfect setting for a romantic date night, or great family fun. Hollywood classics and blockbusters alike are regularly shown on the big screen, so you and your loved ones can relax on the deck chairs, enjoy the action and the complimentary popcorn. 150 feet above the sea, guests will be able to discover the Hollywood Conservatory, a superb indoor garden that brings lush, verdant surroundings Majestic’s already stunning environs. With serenely chirping bird sounds and plush furniture to recline on, it’s an excellent retreat for those looking for a quieter area to unwind in. Take in low-key, intimate performances by live musicians or share your memories on the Wishing Wall, a mosaic tile wall that’s the first of its kind at sea. Looking to treat yourself even more? Head to the Lotus Spa, Princess’ award-winning place of relaxation. This on-board spa offers everything you could need for a relaxing holiday – from al fresco massages and treatments to detoxifying ocean wraps and an aromatherapy thermal suite. Why not go for a beauty treatment before your big night out? The spa’s salon offers all manner of haircuts, shaves, manicures and even teeth whitening! If you want to book a cruise aboard Majestic Princess, head over to our dedicated Princess Cruises page for an amazing range of deals on great itineraries or call our friendly sales team on 1300 857 345.